My passion is telling stories through sculpture. Public art commissions offer me unique opportunities to uncover and relate stories that must be told. And they provide opportunities for meaningful and fun engagement with local communities. 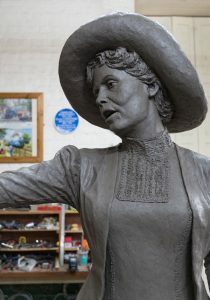 The unveiling of my latest commission – Emmeline Pankhurst – will be in Manchester on Friday the 18 December, marking 100 years since the first women voted in a General Election. Emmeline was the inspiring leader of the Suffragette Movement, born in Moss Side in 1858. With my background in women’s rights and gender equality, this is a particularly exciting project. 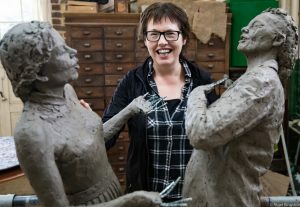 On International Women’s Day 2018 my Cracker Packers bronze commission was unveiled – it celebrates the lives of women biscuit factory workers from the Carr’s (now McVitie’s) factory. I was inspired by the warm and vibrant stories of the camaraderie of the Cracker Packers, past and present. Such stories of working women’s lives rarely make it into formal history yet need to be celebrated and shared with future generations. In April 2016 my 7ft 4in bronze statue of Sir Nigel Gresley, the eminent railway engineer, was unveiled at King’s Cross Station, London. In preparation, I was commissioned in 2014 to sculpt a maquette (or scale-model) of Sir Nigel Gresley and Mallard. For further details see the dedicated sections of this website or my blog. My full-figure bronze sculpture of Sadako Sasaki, with a ‘paper crane’, was unveiled in the Hed Wenn peace garden in Wales on the 21st September 2012, the Word Day of Peace. For further details see the dedicated section of this website. If you are interested in commissioning a piece of public art, please email me at hazel [at] hazelreeves.com. 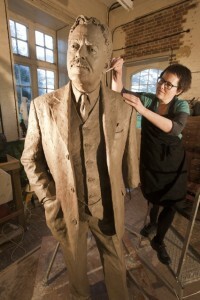 Interested in commissioning a portrait sculpture? It is the ultimate gift – a portrait sculpted and captured in bronze. Whether it is to mark a special occasion, to preserve memories of your children, or to create an heirloom to pass to the next generation, it is an investment that will bring much pleasure. The best way to learn more about commissioning a sculpture is to email me – hazel [at] hazelreeves.com – for further information about the process as well as the costs. As with any portrait, the best results are achieved through face-to-face sittings rather than through photographs alone. These sittings can be held in your own home or in my studio in West Sussex.